There were a number of challenging and exciting manuscripts submitted for the first annual Plonsker Fellowship at Lake Forest College, and it wasn’t easy to choose among them. 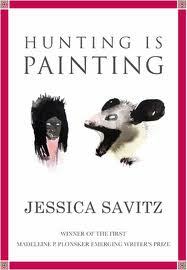 But the manuscript submitted by Jessica Savitz, with its arresting declarative title, Hunting Is Painting, leaped from the pile with its deeply and authoritatively strange configurations of lush lyric language that comes close, often, to the condition of song in its use of refrain and repetition; like Gertrude Stein with a larger vocabulary. The poems follow the rigorous logic of the book’s title, a metaphor or allegory of “gun as microscope,” or as she declares with horrifying and truthful matter-of-factness, “Slaughtering the animal / Was like freeing him with a knife / From a little trap.” The hunter’s attributes of ruthlessness, canniness, and respect for one’s prey, formulate the book’s remarkable aesthetic, which concentrates its attention on facts—of personal biography, of animals and their habitats, of artworks and artists—and bring them suddenly into higher resolutions, new configurations. Some of the poems remind me strongly of Whitman in their readiness to empathize with fellow creatures, human and nonhuman. At the same time there’s a predatory fierceness that startles and clears the eye, so that this poet is one who can recognize that “the dying arrangement is a living being” (“dying and animate / to direct light, or to create privacy”). With sharp, sometimes appealingly goofy wit, the poems confront us with the necessary violence of sensemaking: we kill what we notice, and what we do not. But our gaze preserves the objects of the world even as it pierces them, and they in turn pierce us. I get news from these poems about our condition, and about the price artists are all too willing to pay for a snapshot, a painting, or a poem. They innovate upon their own necessity, and bring us closer to the real. A year later I can affirm that the book is odder, more beautiful, more whimsical and affecting than I first found it. And it has wider ranging subject matter: one of my favorite sections now has to do with the happily doomed love affair of a couple named Snodgrass and Cleo. It's a treat, any way you slice it. The book is distributed by Northwestern University Press and it's also available on Amazon. Interested would-be reviewers should backchannel me. And: this is a fine opportunity to remind writers under forty of fiction and hybrid prose that the 2011 deadline for the fourth Madeleine P. Plonsker Emerging Writer's Residency Prize is April 1, 2011. The judge will be Kate Bernheimer, prolific author and editor of a remarkable anthology of fractured fairy tales, My Mother She Killed Me, My Father He Ate Me, available now from Penguin Press. Put aside the page and close your eyes, Madrid. Bring us into the presence of the oracular, the medium, the stance of he who testifies to something beyond. A stance that's never (only) ironic. The public has always responded to the writer's personality, or the performance of that personality, and writers have always done a striptease with how much or how little of the "authentic" self and its experience can be located in a given work. The Romantics, broadly speaking (Goethe-Wordsworth-Byron through Dickinson-Whitman) can be defined at least epiphenomenally by the performance of persona, though the grandiosity of the High Romantics has become impossible except ironically. It's Low Romantics like John Clare, combining precision of observation with a performance of abjection and self-consciousness that gets linked, appositively, to the objects of that perception, that offer a way forward now. Poets are no longer famous, yet they go on performing personality, just like the ordinary "stars" of reality television. Some of them still lay claim to craft, subject matter, something to say, like the contestants on Top Chef or Project Runway. The purer breeds (Real Housewives, Jersey Shore) stand seemingly naked in "the nothingness of scorn and noise, / Into the living sea of waking dreams" to delight and scandalize us. Poets like poems are disposable (but recyclable) commodities. Poems interrupt the prose of life (as the formatting of poems in The New Yorker has always taught us), indistinguishable from cartoons or advertising. The difference between poetry and reality television is that reality television is popular. Warhol's Marilyn Monroe silk screens and his Double Elvis work as metaphors because their images are so common in the culture that they can be used as shorthand, as other generations would have used, say, the sea. Marilyn and Elvis are just as much a part of the natural world as the ocean and a Greek god are. But the gods have not returned, as nature has not returned. Celebrities no longer have the iconicity they once had, any more than poets do. (High Romanticism = the Hollywood studio system. Low Romanticism = straight to video.) As Warhol predicted, everyone is equally (un)famous, equally (un)worthy of performance and attention. Romantics of all stripes mine our nostalgia for a glamor, heroism, gods, nature that the individual, even a famous individual, never can possess. (I wish I was Cary Grant, said Cary Grant.) As Schiller says, the sentimentalisch poet always defines himself by self-conscious difference from the naive poet. It doesn't matter whether or not naive poets actually existed. We have had to invent them, as we have invented media to which we deform and conform our lives. Because mimesis, like the sublime and beautiful, is not a quality of objects or artworks. It is a faculty of the self. When I say "collaborators" I mean the decentering (as opposed to the death) of authorship, the defederalization of the author. But I am also thinking of >épuration légale, of those French women with their heads shaved in 1944, marching in ignominy to social death past jeering crowds, bearers of the shame of collaborating with power, sleeping with the enemy, doing what it took to survive.